Indian bread recipes are generally made with whole grain flours. Most breads are flat breads. It is bread with unleavened flour. There is a variety of Indian fry breads too. 'Roti' is the common name for Indian breads. 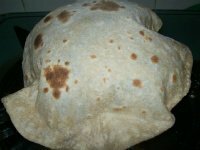 Most rotis are whole grain breads. Whole grains such as whole wheat, rice, jowar(sorghum), bajra, ragi (nachani, finger millet), maize, pearl millet etc. are used generally. These whole grains are ground to get coarse or fine flour depending on what kind of roti is to be made. Some of these whole grain flours are available -ready to use- in the neighborhood grocery shops or super markets but many households also get their whole grains ground in the nearby flour mills. Whole wheat flour is more commonly used to make Chapati, Paratha, Poori, Phulka. Though plain flour is used for certain dishes, the whole wheat flour is healthier and is used all over India. Sometimes the whole grains or the whole grain flours are mixed to make breads which make them tastier and more nutritious. Soya bean is added to Whole wheat to improve its protein content when sending to the flour mill. Some mixed grain breads are : Methi Paratha , Palak Paratha where rice flour, jowar flour, gram flour is mixed to make the texture and taste different. It adds to the nutrition too. Mixing plain flour is a personal choice. I prefer to use whole wheat flour as it has more fiber and contains more nutrients compared to plain flour. 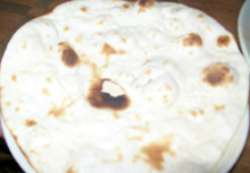 Bhakri, a flat bread is made with jowar, ragi, bajra. It is made without using any fat and is easy to digest. It is very tasty too. It is a great help when you want to reduce weight. Jowar flour is also used to make Thalipeet, a breakfast or snack flat bread, in Maharashtra and northern parts of Karnataka. Ragi (finger millet) is used more in the southern states and in Maharashtra, a western Indian state to make Bhakri(flat bread). 'Ragi flat bread' is called Nachanichi bhakri in Marathi. In Karnataka, Ragi rotti is made as a breakfast or snack. Ragi balls (Ragi Mudde) are made and served with soppina saru or mussup( a greens and lentil curry) for lunch and dinner in the rural areas. A porridge made with flour made with sprouted ragi is used as baby food and is also good for elderly people as it is easy for digestion. Ragi halwa is also made with this sprouted ragi flour. 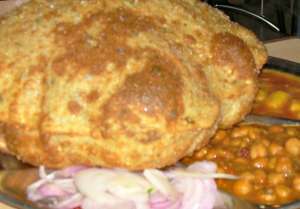 Some Indian bread recipes are common in all the regions in India, such as chapati, poori. Rice, which is a staple food of the southern states, is ground to fine flour in the flour mills and this rice flour is used to make bhakari in the coastal regions of western Indian and to make akki roti in Karnataka. Rice flour is used for making different kinds of dishes, snacks including breads. 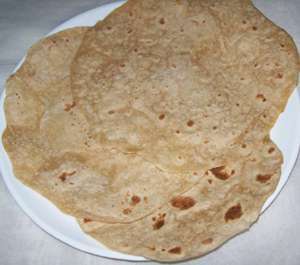 The northern Indian states use whole wheat flour, maize flour to make rotis. 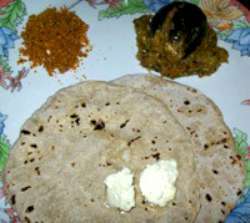 'makki ki roti (maize flour bread) with sarson ka sag (mustard leaves curry) is a favorite of many. I am sure you will enjoy the Indian bread recipes.